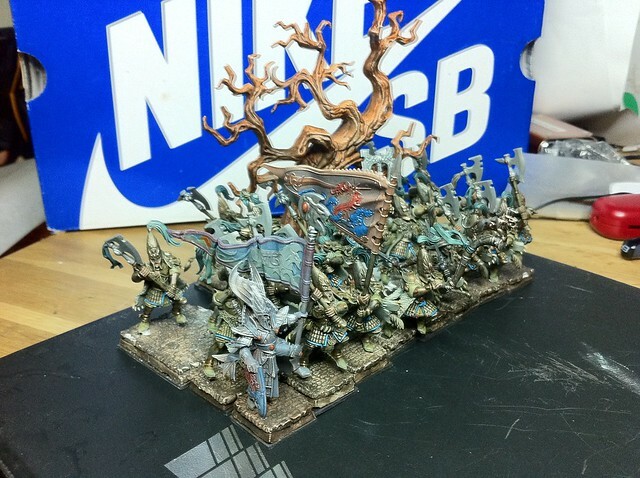 Well here is my armyblog, I started this army in the summer (2012), I took 60 Lothern seaguard and 2 mages with me to our cabin. I got them to close to finished state. 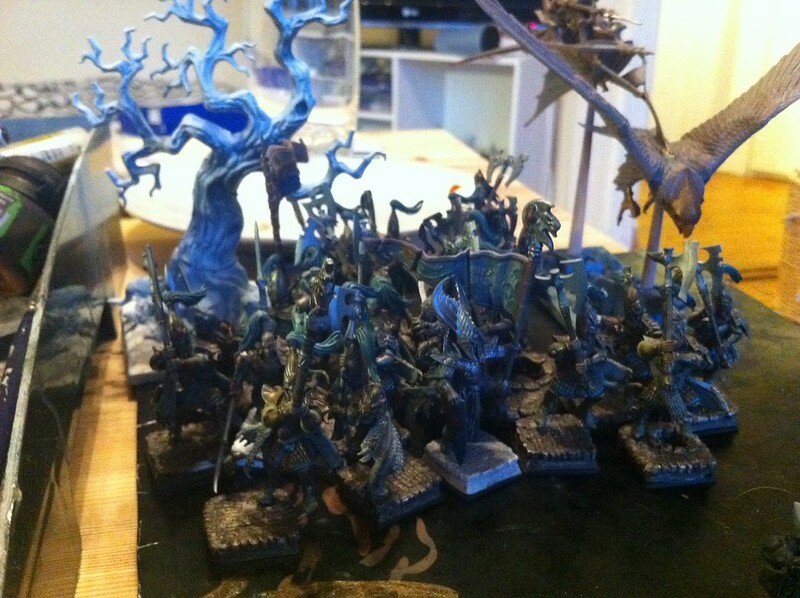 After I came home there was this tourny that came up so I put the Highelves aside and made some new units for my deamon army. 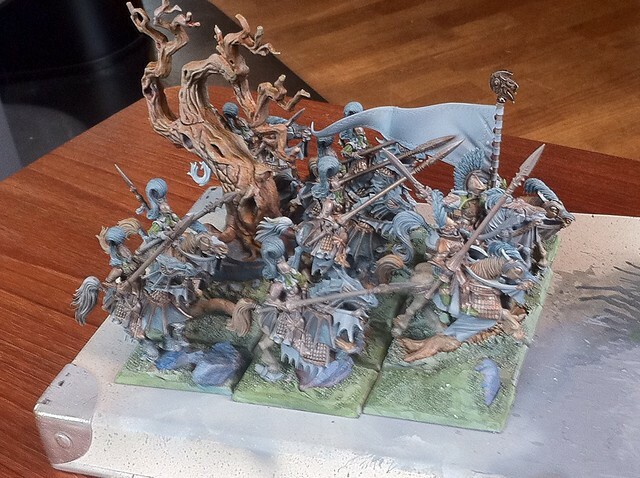 I came second and got nominated to the best painted competition(placed 3rd). The price was the aracknarok spider, wish I traded in for a Dragon. 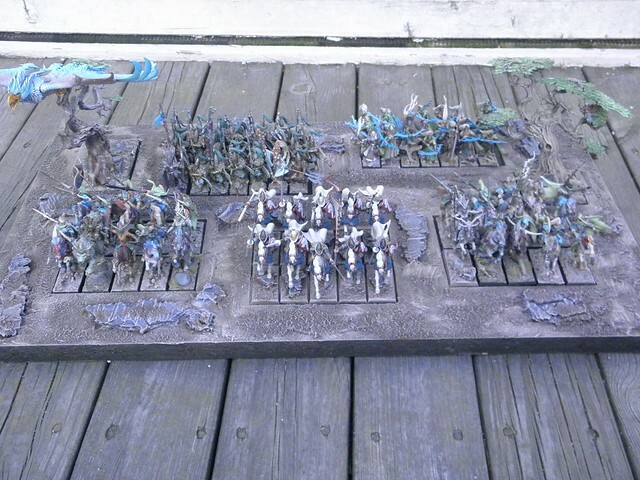 So With a dragon and the 60 LSG I started the adventure of collecting a Highelf army. Last edited by Browncastle on Thu Sep 11, 2014 9:27 pm, edited 16 times in total. Color me jealous ! 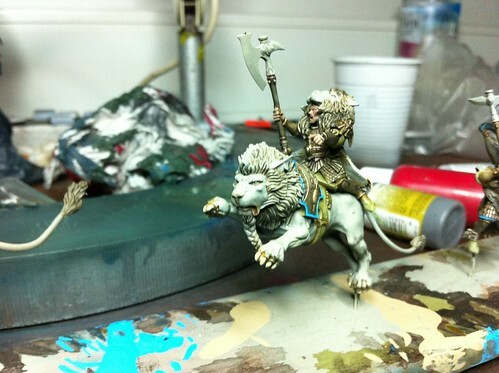 I wish I could get as many White Lions done. Looking forward to seeing more! Ive forgotten to put up pictures of the Lothern seaguard, but will have to wait as Im in nabouring town for the next week. 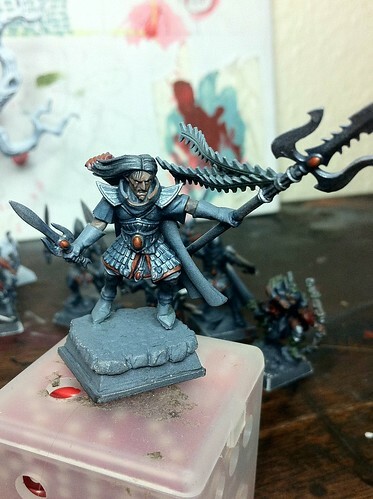 Ive also put the project on hold, to get some Chaos space marines on the table for a tournament in a month. So they will hijack this tread for some weeks. Last edited by Browncastle on Wed Sep 10, 2014 4:57 pm, edited 2 times in total. 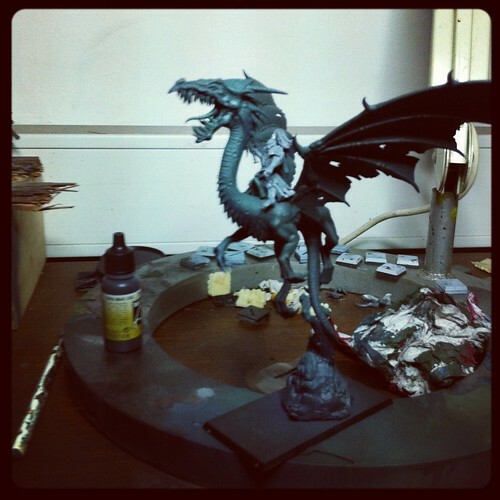 I've always wanted to do the Dark Elves dragon with a High Elves rider. That looks great so I'll be doing that in 2013+. Rest of it looks great. Yeah I been dweling with this idea for a while, and then I placed 2nd in a semi local tournament (3 hours ride) and won a goblin spider, so then I traded that in for the dragon at my LGS, really happy with it, most dynamick dragon GW ever realeased. Though it probly gonna be demoted to a dragonmage mount when Highelves get a new book and dragon next year. BTW I wont clutter this tread with 40k stuff, so I gave rebirth to an old tread I got on Warseer. well not mush done on the list but here are 60 or so Lothern seaguard. 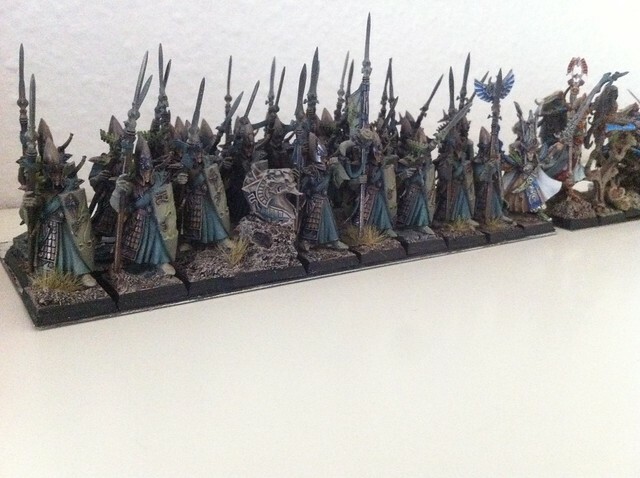 Hey well Ive been gone for sometime, my rapid progress last summer came to an halt, had to many ideas and the one tournament I went to with basically 2 x 30 LSG + 30 Whitelions + 2 x Eagles + archmage and BSB, didnt really go that well, and I started hearing rumours about a new book, so I shelved the army for the time being, moving over to other projects. First I made a 40k worldeaters army, for a local tournament, my first tourny in 40k, went smooth got a 4rd place, my army was the most combat orientated, and of cource I did a lot of practice the months leading up to it. Even had my own little gamingclub at an atelier I rented. Well enought excusses, So the new book brought me back, And Ive been all engulfed in it since it came out. Making lists in excell, and playing some games, and trolling the internet for ideas for new lists. And find time inbetween to get some painting done, while slowly buying all the new stuff, by now Ive got all the new blisters, and the new wonder the sky cutter, still WIP. One of the best models GW ever put out. Not much more done with these but got them some selfmade coable bases, next weeks target will be to redo the bases an paint them up, the idea is to have a coable road going through a wood, Ive painted a 2d consept, and I eagger to put it into life. 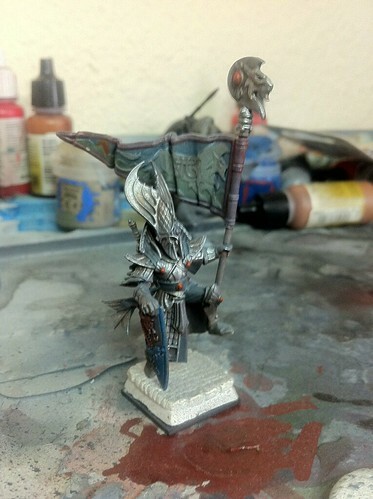 hey done regular work on my army, now let me introduce my take on the silverhelms. 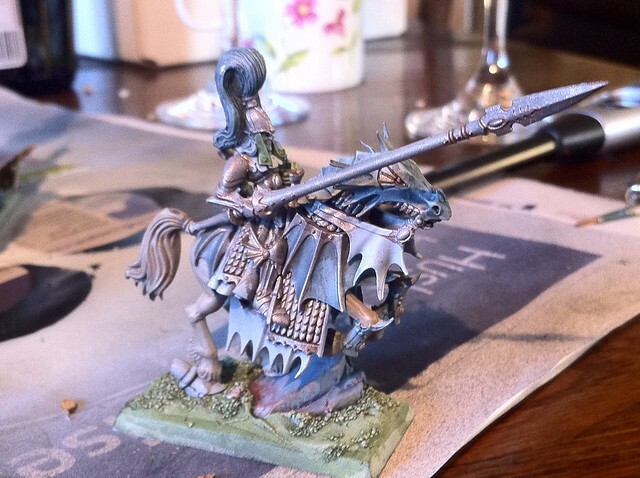 Ive used the oldglade riders as riders, and used steeds and legs form ellyrian reavers and dragonprinces. Wholeunit, just missing the characters, ofcourse the 2 lioncav, will be the noble/prince, and Ive got a mounted mage primed for painting. And a little photo help from a girl. skycutter starlance weilding noble, with gw ofcourse. Ill make a grounded model for him also. Excellent!! Very flufy army! Very inspirational! Very nice. 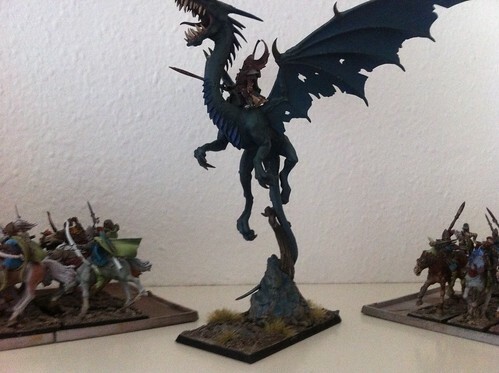 Love the dragon and your cavalry look great. Any chance of some more shots of your lionhood, I'd be really curious to see how that was done and maybe try to replicate it. 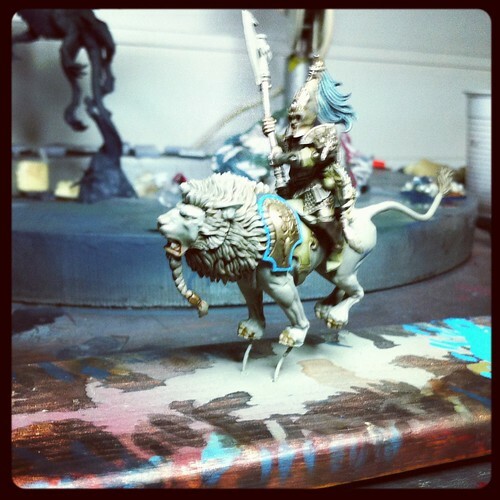 So what do you use the Lion Cavalry as? Dragon Princes? Thanks, As ferny said: They are characters, noble and prince. I used to have them on 40mm to count as unitfillers for WLs. Excellent silver helm unit. 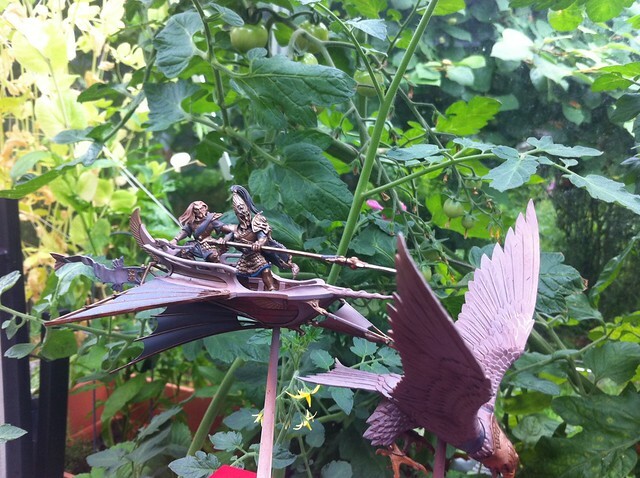 That's a great way to use the old wood elf glade riders. 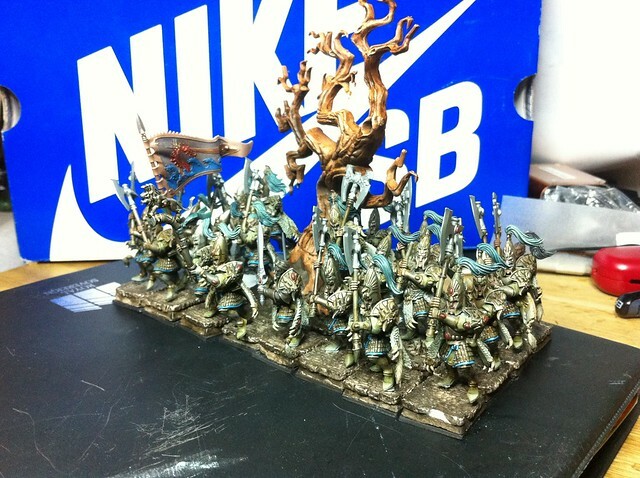 Regarding the old wood elves, does anyone else prefer the old style of wood elves to the new? 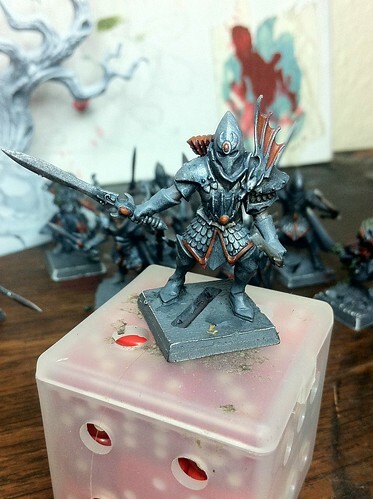 I just liked the toned down, classic look of the old miniatures as compared to the current range. The current models seem to be just trying to hard at looking menacing. I suspect the classics will always have a certain timeless appeal to them while this current range will look very dated in 10 years down the road. 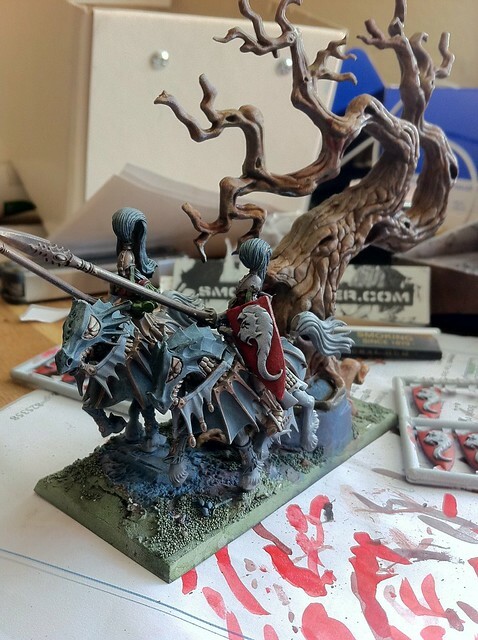 Yeah I really like those old glade riders, an there sureis alot of nice sculpts from older editions, old scouts are amasing to bad I only got the command:( Old Wardancers are a good example of better models of older editions. Lets hope next edition brings back more of the good old Woodelves. 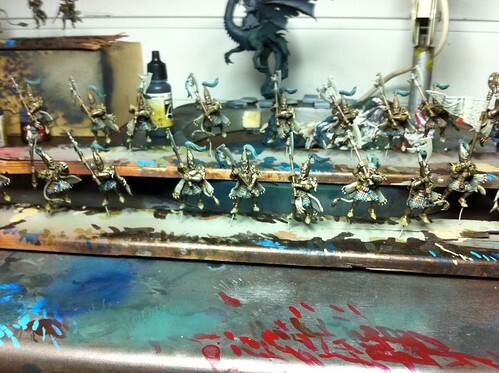 Basing next version of wardancers on 4th ed ones, with more dynamic poses, would be golden. These gladeriders have been lying around for ages, but I always found them cool, but the steeds allways looked boring too me. So finally I got to make something out of them. Im very fond of the outcome on these. 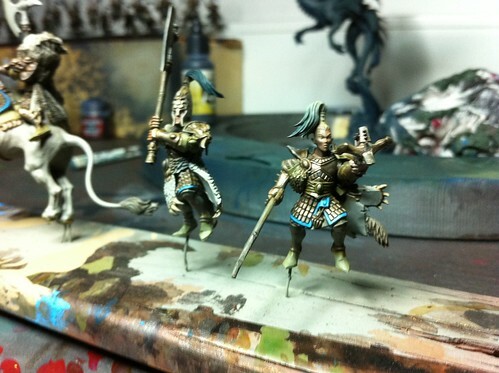 Ill do some more detailing on these then Ill leave them, and finish of some other random models for the army. jewels and stuff will be saved for long winter nights, right now I just need to get this army on the table. 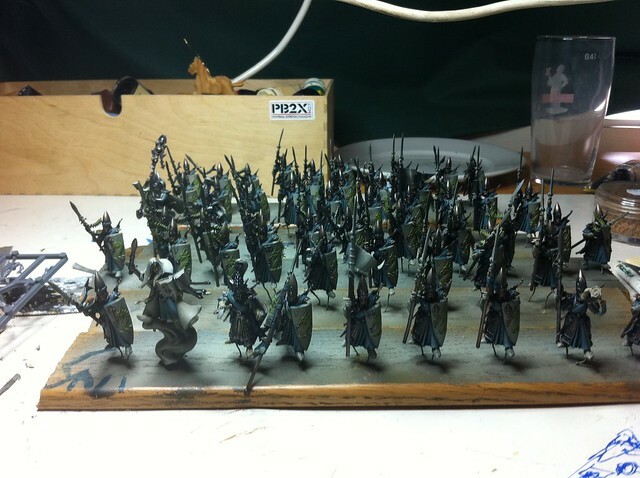 Ive got about 30 painted archers that need new basing and a little touch up. The lions need to be partially rebased. So still so work to do. My dilema at the moment is whether I need a frosty or If I can go dragonmage in stead. Id like to see a list with both frosty and dragonmage, I wonder how that would fare?? Your unit has inspired me ... 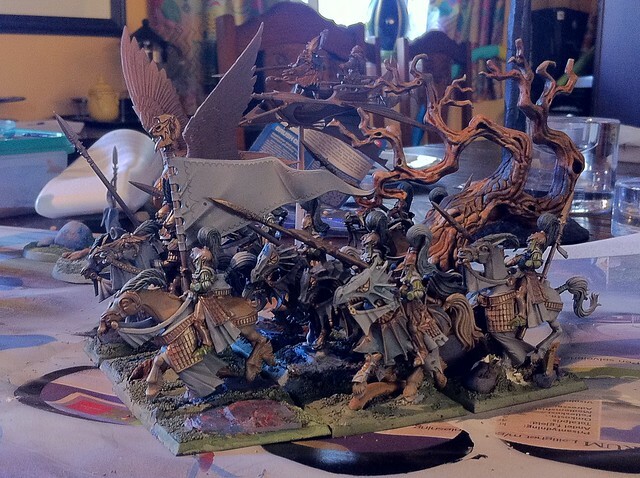 I may pick up some of those old glade riders and do a similar cavalry unit. 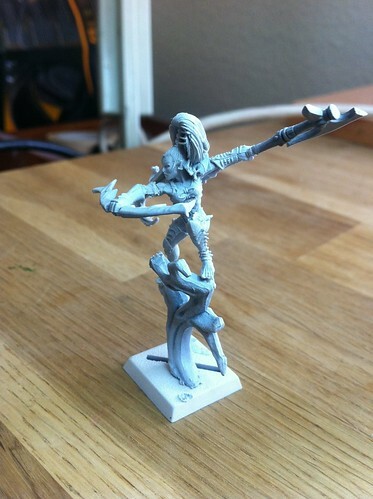 I agree with you ... much prefer the older style of wood elves. 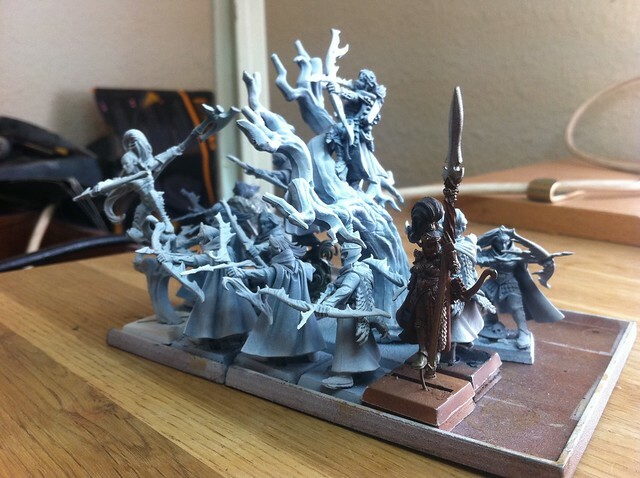 However, I doubt GW will change even in the next wood elf release as they seem very reluctant to change any of their core plastic models. I imagine we'll be stuck with strange, leaf-shaped clothing and odd looking half-forehead masks on wood elves for some time. In terms of whether to add a frost phoenix or dragon-mage, I can't help you. I'm completely out of touch with the new rules. 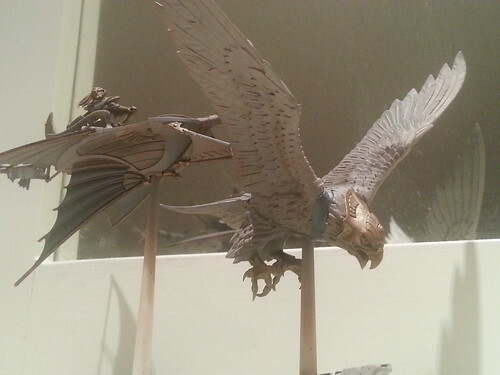 If you do go with a frost phoenix though, I'd suggest going with another model eagle and just paint it with blue feathers. The new model isn't too impressive in my view. It has a very static pose and the giant snow flakes just look cartoony. 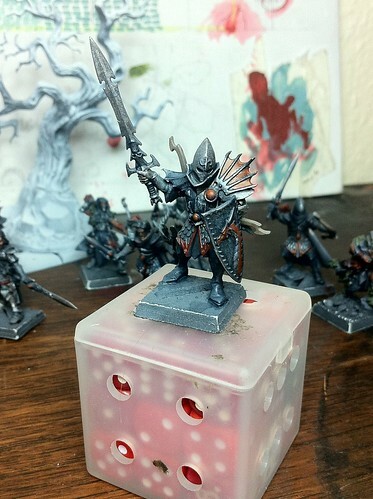 Great silver helms - love the conversions. I too liked the classic wood elf look, but lets face it - it was too similar to the high elf imagery to keep it that way. There's a much more distinct, wild, semi-indian-semi-celtic feel to them. And its ok. I wouldn't worry ... just checked ebay and there are loads of them. Available at reasonable prices too. And here is where my BSB is at the moment. Changed his banner With the Whitelions, since they took it I quess. Next unit up will be the sisters. Last edited by Browncastle on Thu Sep 19, 2013 6:57 am, edited 1 time in total. So did you want more old Glade Riders? 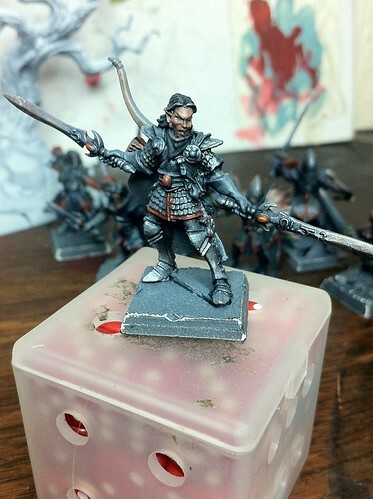 Also very nice work, I like the mix of models in the Shadow Warrior unit. 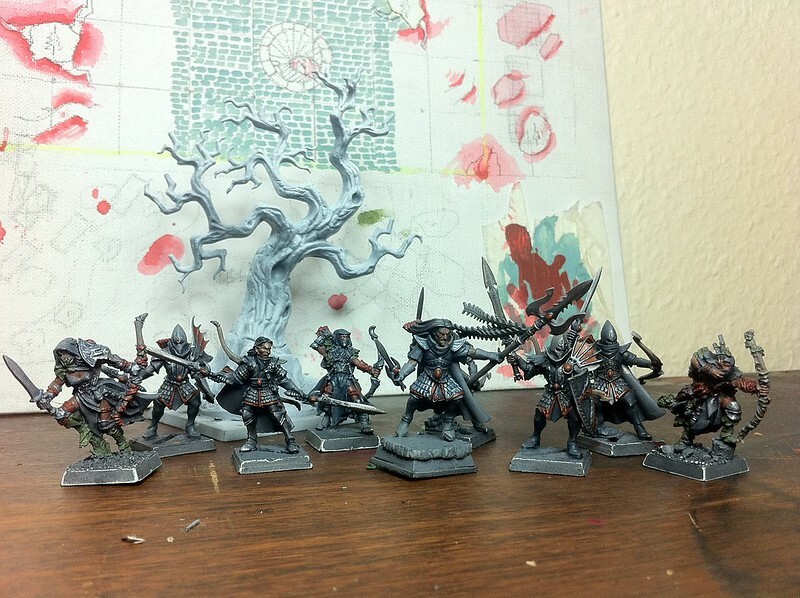 I really like your Shadow Warriors. The mix of parts you've blended together turns them from just a unit of Shadow Warriors and into a band of heroes and adventurers! 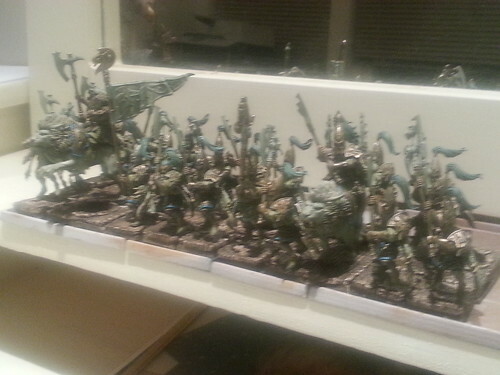 Well last Picture was a mess right, well heres how it looks after an afternoon of reposing and basing, not finished yet, still some loose figures and the bases are just base colored, almost! Had to take a pic With the seahelm bsb, can you quess which armour hes sporting? 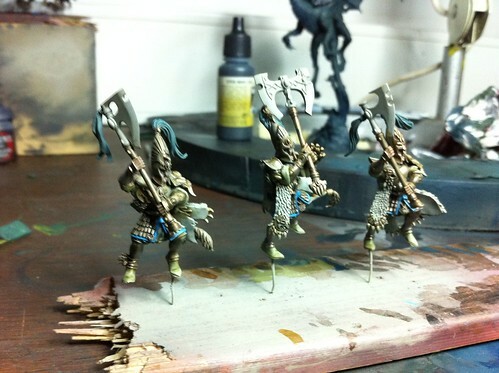 They look nice mate, the axe blades look a little flat though, still working on the metals? Thank you, yess the weapons have only gotten a watered down layer of vallejos silver metallic, with some drops off dark sea grey. Im working out a resepie for the weapons, I would like to have some blue tint in them. But needs more testing as magical weapons should also be blue tinted only sharper, so I need to make 2 respies with enough contrast between them.